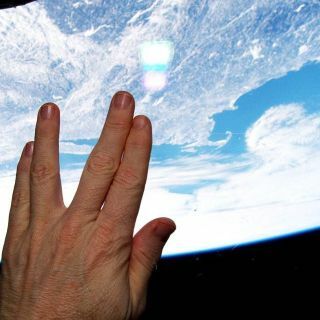 NASA astronaut Terry Virts honored the late Leonard Nimoy with a Vulcan salute from the International Space Station, with the Earth below. A fan documentary "For the Love of Spock" is crowdsourcing funding to highlight the famed actor. A documentary commemorating the life of Leonard Nimoy and his iconic "Star Trek" character, Spock, will likely require more funding after exceeding its Kickstarter goal, the film's director says. Nimoy's son, Adam Nimoy, began working on the film project, called "For the Love of Spock," in November 2014 in consultation with his father, who died in February at age 83. The Kickstarter campaign went live this summer and concluded last month with $662,000 in funding, easily surpassing its goal of $600,000. Nimoy said he wants to add visual effects and get the rights to more of his father's extensive catalog of films, theater performances and other productions. Although he's considering another fundraising campaign following the successful crowdfunding campaigns for fan productions such as "Star Trek: Axanar," he said the time it takes to run those campaigns also takes time away from producing the film. "We're trying to reach higher and do a first-class film — $600,000 is not that much money," he told Space.com. "We're budgeting as tightly as we can and looking for other sources to finance." The upcoming 50th anniversary of the original airdate of "Star Trek" on Sept. 8, 1966 helped inspire the younger Nimoy to make the film. His father famously portrayed a half-alien species called Vulcan, which was prided for its scientific work and logical thinking. But the other half of Spock's heritage was human, allowing for the occasional burst of emotion. Leonard Nimoy is widely credited with the invention of the famous "Vulcan neck pinch" to subdue enemies, as well as the Vulcan salute, often used with the phrase, "Live long and prosper." Spock was Leonard Nimoy's first large role and the one he was best known for, even as the actor expanded to roles in television (such as in "Mission: Impossible"), film and theater. "He was very, very busy during the 'Star Trek' years and the decades that followed, trying to ride the wave of popularity to find new ways to keep working — which was his passion," Adam Nimoy said. "He was a workaholic, my dad. It was interesting to see all the different stuff that he did." Hollywood rebooted the "Star Trek" franchise in 2009 with a new set of films in which Spock was played by Zachary Quinto. Quinto and Leonard Nimoy ended up becoming friends, and even filmed a car commercial together in which the actors traded barbs and "Star Trek" jokes while racing to a golf course. As part of the work for the documentary, Adam Nimoy will go to Vancouver to talk with some people associated with the latest "Star Trek" film, which is being filmed now. Quinto will narrate the documentary, which is expected to be ready for distribution in January if all goes according to schedule. "We did raise a lot of money, and that is going to take us a very long way," Adam Nimoy said. "We're going to have a film. We know we can make a film. But we know from "[Star Trek]: Axanar" that the more money they raise, the more we can add to make it a better film."